It's been reported today that President Trump is considering assigning Stephen Miller as the new White House Director of Communications. An interesting moment occurred between Mr. Miller and CNN's Jim Acosta earlier this week. What follows is a partial nonverbal analysis of their exchange. STEPHEN MILLER (beginning at 3:30): "Jim, it's, actually, I, I, I'm going to say, I am shocked at your statement, that you think that only people from Great Britain and Australia would know English. It's actually - it reveals your cosmopolitan, ah, bias, to a shocking degree - that in your mind - No, this an amazing, this is an amazing moment, this is an amazing moment - that you think only people from Great Britain or Australia, would speak English, is so insulting, to millions of hard working immigrants, who do speak English from all over the World. Jim have you honestly - Jim have you honestly never met a, an immigrant from another country, who speaks English, outside of Great Britain or Australia? Is that your personal experience?" During 3:47 - 3:48, as he says, "... this is an amazing moment ...", Mr. Miller lifts his hands to a moderate-to-high level (just above his shoulders) and gestures with both palms toward the audience. The palms-held-toward-the-audience gesture, is a hyper-alpha, hyper-aggressive illustrator. It transmits condescending, arrogant, and patronizing emotions and should, with rare exception, NEVER be used. The higher the hands are held - the greater the force of these emotions. An instant after he says, "... moment ..." (during 3:48), Miller's displays a "Loose Tongue Jut" (Not to be confused with a "Tight Tongue Jut"). In this example, it's also a type of microexpression. A loose tongue jut is an indication of the emotions: "I've been bad/I'm about to be bad", "I've been caught/I'm about to be caught". 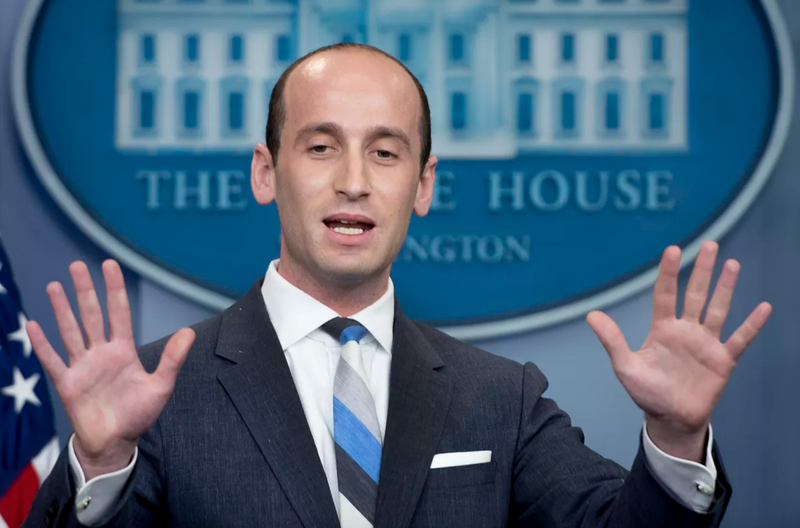 In this moment, at some level, Stephen Miller believed his retort was too extreme. Stephen Miller's voice is rather monotone. A lack of vocal variety is robotic and off-putting. Mr. Miller has little variation of his facial expressions - which is a nonverbal equivalent of a monotonous voice. This gives us the feeling he's wearing a mask (and is one reason masks elicit fear). 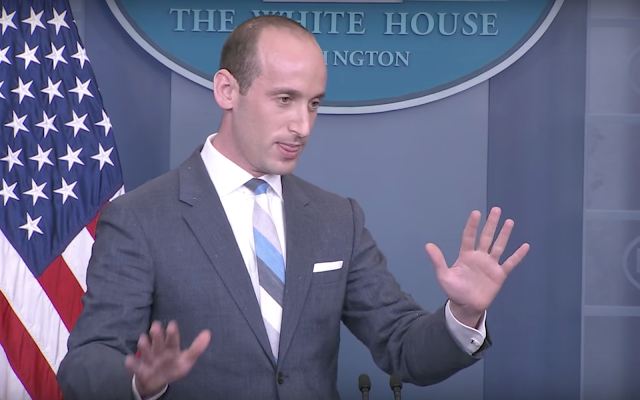 Perhaps the most profound reason for this "creepiness" factor is Mr. Miller's droopy upper eyelids (the medical term for this is "Ptosis"). Although a portion of his ptosis seems to be longstanding, perhaps even congenital - his droopy eyelid behavior is virtually always exaggerated - often dramatically - when he is speaking to an audience. This has the effect of projecting and amplifying emotions of anger, disgust, and contempt. 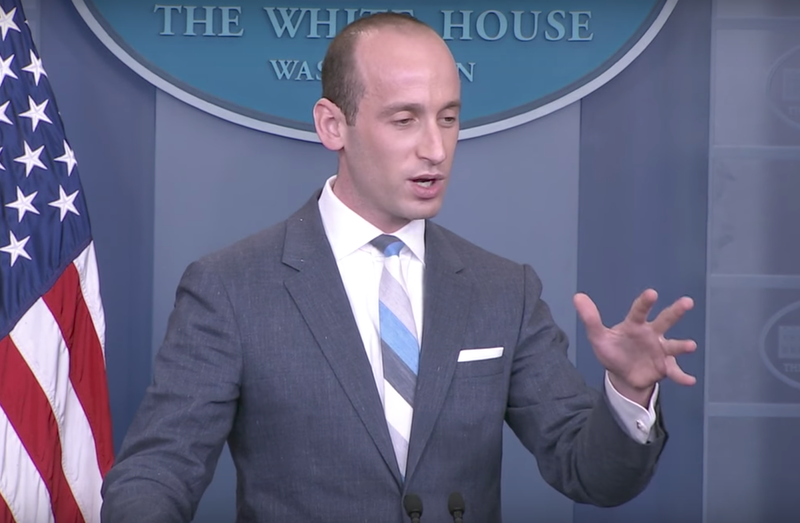 In the image above Stephen Miller is feeling disgust as speaks to Jim Acosta. Droopy eyelids also project motives of nefarious secrecy - so much so, that this nonverbal behavior has been used for centuries by actors playing evil roles. Such facial expressions have also been used to a great degree with similar animated characters.